Christ is Born and Revealed Amongst Us! Blessed is the Revelation of Christ! Good tidings to you and to us! The Armistice of Mudros was signed on the Greek Island of Lemnos on October 30, 1918. With this signing the Turks agreed to bring to an end on November 1 the hostilities between the Ottoman Empire and the Allies. The Armistice of November 11, 1918 between Germany and the Allies ended World War I in Europe. Well before all this and certainly afterwards, a tattered, pathetic remnant of the Armenian population who had avoided or survived attempts by the Turks to annihilate and exterminate them showed their faces in earnest and flocked to a few places like the Kharpert (Harpoot) region. They were for the most part young, indeed most were children − and most were full orphans. There were even some �oldsters�− mainly women but very occasionally, a feeble old man. The chapter concerning what comprises their �stories� has yet to be dealt with in full detail. Quite a few accounts do, of course, exist in the form of written and oral history memoirs by survivors (usually in Armenian). But it is all too often assumed that most know about organizations like the Near East Relief In fact, this organization came into being largely to help these orphan survivors. It is part of American history that is poorly known − even unknown. The �Story of Near East Relief� written by Rev. Dr. James Levi Barton, the man who was a major factor in its founding and operation is relatively well known. He guided its activities for nearly all of the 15 years it existed. Many consider Barton�s book to be the definitive history of that organization. We agree that this is appropriate and justifiable. It also happens to be the only substantial story written. Even so, Rev. Barton titled his book �Story of Near East Relief, An Interpretation� (our emphasis). He did not say, as some have erroneously claimed, The History. We believe that a considerably more humanized and personalized story of Near East Relief can be and needs to be written. 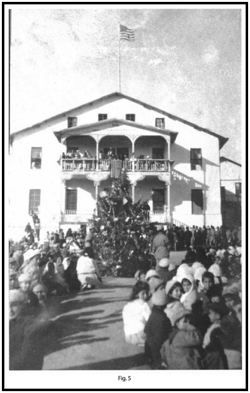 The Christmas celebration at Mezreh/Harpoot on January 8 [no, not the 6th] 1920 for Armenian orphans that will be described here is but one event that goes far to put a more personal face on the story of the recovery and rehabilitation of the Armenians from near total destruction. True, the full story of the Armenians of Kharpert and elsewhere is, of course, one of much sadness and disappointment, but the fact that this celebration took place in a very significant region of historic western Armenia, the name of which is well-known to many Armenians in today�s Diaspora, and at a time when one was not at all not sure as to who had managed somehow or other to live or to become �free or liberated� as some of the survivors would say in Armenian �inchbess azadetsak� deserves to be told. We are happy to be able to do this in a very small way based on archival materials, and even to illustrate the �festivities� with a few period photographs. Readers all know and all those relief workers on site knew that January 6th is �Armenian Christmas� – but as it turned out it was on January 8 that this particular celebration took place. The main purpose of this paper is to provide some details of a Christmas celebration arranged for Armenian orphans by the American relief workers at Mezreh right after the war. (Incidentally, the word orphan is used in the broadest sense of the word. This will become clear as we proceed.) It is surely a miracle that any Christmas could be celebrated, much less one in this remote region so soon after the genocidal events had taken place. The celebration seems deliberately not to have focused on the religious aspects of the holiday even though many of those who planned and carried out the celebrations were deeply religious individuals. Some had even served as missionaries as recently as a couple of years earlier. This Christmas celebration was tailor-made so to say for the Armenian youngsters and their immediate care givers−their Mairigs and Kuirigs (the �mothers� and �sisters� who supervised and looked after these orphans on a daily basis). Clearly, the Christmas events were possible only because a group of American relief workers were on the scene. These dedicated volunteers made certain that at least some relief resources, scarce as they were, would be used in trying to do something on Christmas for all those in their care who had suffered so greatly. The relief workers had been allowed into the Kharpert area only by mid-June 1919, around 6 months after the armistices had gone into effect. They had hoped to be able to pitch in much earlier and help those in need that they had been told about back home but it had been deemed unsafe by those in charge to travel into the remote interior of Turkey until then. Before we delve into the main body of our presentation on the �Christmas for Armenian orphans�, it will be useful to present what is often called a mise en sc�ne, or a description of the physical setting of the action. Many readers of Groong will know that Kharpert was not only where their ancestors and relatives came from in the Old Country, but also that it was the center of a busy field of American Protestant missionary activity – carried on largely by Congregationalists. The �parish� field was huge by the standards of the day, and even today one marvels at the territory they chose to cover. It took two weeks� journey to traverse by horse from north to south, and a full week east to west. For a succinct perspective of Harpoot in the late 1800s one can do no better than to quote an early account by Rev. Dr. Herman N. Barnum from his �Sketch of the Harpoot Station, Eastern Turkey� published in The Missionary Herald vol. 88, April 1892 pgs. 144-147). Figs.1a and Fig. 1b. 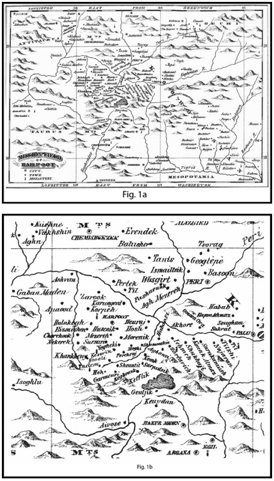 Map reproduced from �Ten Years on the Euphrates; or primitive missionary policy illustrated� by Rev. C.H. Wheeler, American Tract Society, Boston, 1868). Original foldout map facing pg. 38. The precise location and relative positions of the places named is imperfect but the map serves our purpose here very well. In the final report dated February 9, 1918, United States Consul Leslie A. Davis presented to the State Department�s Consular Service a 132 page document in which he described in considerable detail the events associated with the massacres and the deportations as they unfolded and happened in his Harput Consular district. He described not only what happened in Harput and Mezreh during those fateful years but told of what he encountered in a number of nearby villages as well. Where Did the Armenian Orphans Come From? How Did they Get There? In view of what we have written above, and to allow us to proceed with a proper understanding of the situation, we need to address a couple of very important points. Some of those who seek to deny the reality of the genocide of the Armenians by the Young Turk government have repeatedly drawn attention to the fact that Armenians could be found in the region when the Armistice with the Allies was signed at Mudros. In other words, Armenians could not have been killed through any genocide or massacre or any other kind of criminal action (hence the expressions �so-called massacres or so-called genocide�). This patently wrong view that virtually all Armenians had to have been eliminated reflects the level of ignorance of those who have very little understanding of what the legal, not to say moral parameters of the crime of genocide is all about. Perhaps deniers and those who seek to misrepresent the events of 1915 and onwards clutch at any and all straws to defend their ill-guided position? What we have just said, of course, applies in the main to females who had by one means or other avoided �full deportation� so to speak. So far as grown men (martikuh) or adolescent males (dughakneruh) were concerned, occasionally special reprieve, usually temporary, was given to a few of those who were in what might be called �critical industries� or at least critical for some at a specific time or other. Some bakers (again known to us through personal stories) who, for instance, could bake bread for the Turkish military were allowed to stay and work their ovens. Tailors who owned and could use sewing machines were sometimes retained to sew military uniforms, and even garments for the wives and families of Turkish officers etc. The same applied to shoe makers who could make boots for the military etc. Makers of kerosene and oil lamps and lanterns (labders in Kharpertsi Armenian) were exempted for a while, and on and on and on, so forth and so on. We will not include stories of the odd Armenian males or youths who feigned death, or those who were taken for dead as they lay hidden, covered in piles of those slaughtered, or even women left for dead who crawled out of wells over dead bodies, eventually to escape (yet again known to us from survivors). Some of the men and youth who survived massacre were sometimes dressed as women, and were spirited as quickly as possible out of the region by Kizilbash Kurds through the Dersim and eventually towards Russia. When all is said and done, each of these groups of Armenians, totaled a relatively small number, and then again, many were eventually deported and/or killed, even those who had nominally gone through the motions of converting to Islam. It often took more than circumcision and taking a Turkish name to convince the Turks of the sincerity of the conversion of any Armenian man. These converts were usually used for whatever purposes and eventually usually dispensed with. Surely not all though, because we are starting to learn of many converted Armenians (albeit mainly women) who had married Turks, had offspring and whose descendants are now �surfacing� in a nominally more liberalized Turkey. Turks who have oftentimes fantasized about the purity of their �blood� will have a lot of contemplating and reckoning to do when they finally acknowledge that they frequently have more than a small dose of Armenian genes in them. Fig. 2a and Fig. 2b. Scene outside the scrub station for Armenian orphans. (See excerpt from Dr. Parmelee�s letter above.) In Fig. 2a Margaret H. Niles is on the far right. The condition of the orphans was deplorable of course but one somehow can detect a bit of relief in some of their faces knowing that they would be taken in, and thus be �saved.� Many others waited for long periods patiently hoping to get in but could not be admitted because there was insufficient room and money to cover costs for the support and maintenance of all who needed it. The upper panel (Fig. 2a) is from the collection of Frances and Laurence H. MacDaniels� Near East Relief Album at Oberlin College Archives. The lower shot (Fig. 2b) is from a private collection. Readers will not be surprised to hear that there are extensive archival materials in the U.S.A. and elsewhere associated with the relief given by various organizations. Most of these have barely had their surfaces scratched. The �Near East Relief� materials comprise one of the most significant of these archives. It came into being largely because the Red Cross had its hands full. The Red Cross people (other than Clara Barton�s mission to Turkey after the Hamidian massacres) had little familiarity with the region unlike the many American missionaries who had served in the region before the war (more below). But there were others of course. Many have heard of the Near East Foundation Archives housed at the Rockefeller Archives at Sleepy Hollow, New York but having suffered loss through fire and de-accession they seem to us to have fewer items dealing with the earliest relief efforts, in contrast to a richer collection of the later ones (Personal knowledge). Volunteers, mostly Americans but some other nationalities as well, especially the Danes at Mezreh, attempted to save and extend some friendship to the remnants of the Armenian people surviving the slaughters and hardships, especially the orphans both in Turkish Armenia and in Russian Armenia. At Harpoot, and everywhere else, the bedraggled Armenian remnants were all inevitably exhausted and infected with every sort of disease imaginable –many were described as �half-dying�. Mary W. Riggs, the sister of Rev. Henry Harrison Riggs, who like Ruth Parmelee was from an old missionary family and spoke Armenian, had returned to Harpoot with the first returning American relief workers in June 1919 summarized it this way:-�After the terrible days of open massacre and deportation were over there came a time when by tens, and then by hundreds, the groups of ragged homeless refugees began to appear in Harpoot – exiles from the north or natives from the place returning after months of wandering to ruined homes. All in utter want and deadly fear – two-thirds of them children – the rest women – few men survived. For years an American mission, centering about Euphrates College, had worked in old Harpoot. It proved a very friend in need and relief sent from America saved thousands alive [in contrast to saving departed souls]. Even after the Americans were forced to leave work went on in the hands of one faithful woman [really two who were Danish subjects] – Miss [Maria] Jacobsen [and Miss Karen Marie Petersen] struggling to keep alive the little children who had been rescued and placed with destitute Armenian women. The Harpoot Unit now includes thirty-four American workers, of these, seventeen are now located in the City of Harpoot, eleven in Mezereh, three in Arabkir and three in Malatia�. �We keep taking in new orphans, mostly little boys who have run away from their Turkish masters. We average forty new children a week. At the same time we are giving back to their mothers and other relatives those who were taken in during the summer or last winter  when their relatives were not able to keep them. An allowance of money is made, when necessary, so that they may not suffer too much. It is a sad business at best, putting the children out, for in most cases they are better off with us than with their relatives. There are many tears shed, and my heart aches as I send them out. But our funds do not permit us to take care of them longer in the orphanage.� (From a report entitled �Harpoot� by Mary W. Riggs in the New Near East May, 1920.) See Figs 3 a and 3b for photographs of some of the considerably older survivors. Figs. 3a and 3b. Pictures of some of the adults who survived in Harpoot and were helped by the Americans. 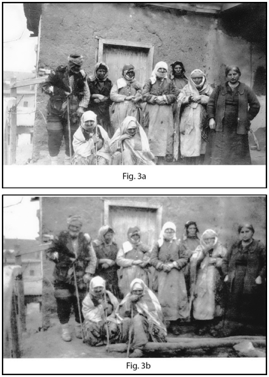 The Armenian woman on the far right still remains unidentified but she is what may today be termed a �caregiver.� Fig. 3a derives from the MacDaniels collection at Oberlin College Archives. Fig. 3b derives from Smith College Archives. We have seen still another photograph of this group, slightly different shot, in a private collection. Again, multiple exact prints or near-exact prints serve to underscore that photos were often shared and exchanged between and among relief workers. The negative for Fig. 3a exists and was taken by Dr. L.H. MacDaniels (more later). American Committee for Relief in the Near East – the A.C.R.N.E. 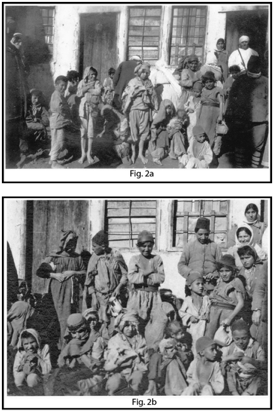 Photographs associated with orphans, and even seniors who survived the genocide against the Armenians by the Young Turks from 1915 to 1923 understandably deal largely with their sufferings. Virtually all these pictures focus on the great need for help, both financial and otherwise, from donors. They fall into the category of Publicity Photographs. Many, indeed most, images provided to the public in magazines and in newspapers may justifiably be described as pathetic (see Fig. 4 for a picture from the cover of New Near East May 1920, the very issue in which the report by Mary W. Riggs written from Harpoot and quoted above is to be found). One has to look very hard to find anything that even remotely approaches what might be regarded as �cheerful.� A considerably less investigated, and hence underexploited source of photographs come from albums and collections assembled to greater or lesser extent by relief workers and relief workers who had served earlier in a missionary capacity – we might add �mainly�, but by no means exclusively. And, it needs to be underscored as well that the vast majority of photographs, publicity and otherwise, derive from those more formal photographs by professional photographers and snapshots by amateurs taken on site or during service in Armenia, specifically from the Erivan, Etchmiadzin and Alexandropol regions. There indeed was immense suffering and hence great need in these places, but such locations were where the relief workers and care givers would be able to remain considerably longer than those workers who would be allowed to remain in Turkey. 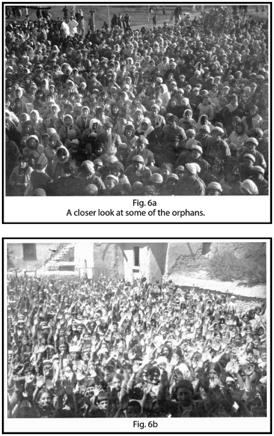 Many will be familiar with photographs taken in connection with the huge orphanages –some accommodating 17,000 or so orphans and one said to be the largest orphanage for anyone, anywhere in the world. Fig. 4. Cover from the May 1920 issue of The New Near East (volume 5, number 9) seeking to elicit pity and sympathy from potential donors to aid in relief work. 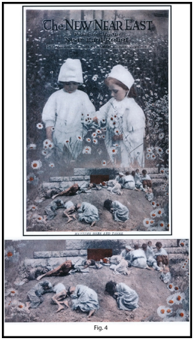 The upper portion of the colorized image shows youngsters in America plucking daisies in springtime. By way of contrast, starving Armenian children lie in squalor and dire need. The lower part of the cover has been enlarged to allow a closer look. The colorized cover derived from a black and white photograph which will be recognized by some. �I wish you might all have seen the wonderful sight that I saw last Thursday [8 January], when we got all our orphanages together for a Christmas celebration. It thrilled me through and through and gave me inspiration for the work of the new year. It was a glorious day with bright sunshine and no snow on the ground, the last of quite a succession of such days, and everyone was happy and excited. At noon they started towards the hospital yard where they were to meet, each orphanage sending out its 75 to 100 children with two or three workers, and from our house on the hill we could watch these little groups winding down towards the plain. It is a distance of three miles, and as there were many little tots to go, their progress was slow. The tiniest ones rode on the backs of the older boys and girls. The hospital yard was ready for them. In the center was the pretty tree, and all about were signposts bearing the numbers of the orphanages, −1 to 30, omitting only three numbers, because the Old ladies Home, the Scabies hospital and the Infirmary on the hill could not be represented. As each orphanage reached the gate, the children formed in line and marched to the post bearing its number and grouped around the post. Many sat on the dry ground, some had blankets under them, and many stood up. At last our 2,500 orphans and several hundred others, − workers, hospital patients and friends, − were all placed and I had the privilege of standing on the hospital steps to call off the numbers of the program. From that spot I could see every one and enjoy their joy. While people were still getting arranged, Mr. [Gardiner] Means went about from group to group and gave them lots of fun. He had them shout out the numbers of their orphanages, counting from 1 up in unison. It helped to keep them warm and happy and roused quite a spirit of enthusiasm. The program began with songs by different groups. In the midst of it we found that the children were getting cold, so we had an intermission during which they had some vigorous gymnastic exercises. During the singing of the last song on the program Santa Claus appeared, riding up to the front entrance in his sleigh and eight dashing reindeer; only the sleigh was a gaily decorated ox-cart drawn by four yoke of oxen which were driven by eight big boys all dressed up in white sheets. Santa was well gotten up in red and white, and made a fine appearance. The orphans very soon recognized him and were delighted that the Hairig (Little father) [Rev. Henry H. Riggs] was giving them this joy. He rode around the yard once or twice and then stopped beside the tree where he had distributed to the various orphanages great bags bulging with presents. There was an American in charge of each group, and we opened the bags and distributed the contents to the children and their Mairigs (Matrons). Each Mairig received soap, and each child nuts and raisins done up in a square of unbleached muslin to be used later as a handkerchief. We knew of nothing that we could give all around that would be more appreciated than handkerchiefs, for there had been none given out before. If a child was able to get hold of a little piece of cloth to use, he was fortunate. And they were all delighted. We were able to put into each package three pieces of American candy, a very special treat. It was quite a job to prepare all these packages beforehand, but when we all worked together, twelve or more of us, we could fill about 1, 200 in an evening. It was a most inspiring sight to see all our orphans together and to see their happy faces and hear their expressions of gratitude and pleasure. We all love the little ones, and they love us. We often see a thousand of them together, but not 2,500, as they are scattered in different towns, and we have no building that would hold them all. We are very happy that we could have the gathering that day, for ever since the weather has been very bad, and snowy. We now add here some additional perspective on both Harpoot and the Christmas celebration planning and the actual celebration from letters written by Dr. Parmelee. At this season of the year, our hearts turn very naturally to our dear friends in the home-land – longing to see you all, and yet happy to be able to cheer up those who in such great need and darkness. In America I should have been tempted to spend a more selfish Christmas, while here I must take some of the many opportunities to do for others. Our celebration is being spread over some days, even our own festivities, because of the absence of some of our circle. We gave each other some remembrances on Christmas morning, but are reserving our turkey dinner till we are all together again. Then, as the Armenian New Year�s and Christmas come later than ours, we are planning our entertainment for the orphans about ten days from now, if we can catch some fine day. It is to be in the hospital compound, this being the most central location. We hope to have some other gifts for our sick children and the hospital workers, but for the orphans in general, the gift will be a square of unbleached muslin (to be used as a handkerchief later) with some raisins, roasted peas (a special kind, which is liked very much), and three pieces of American hard candy. We have begun preparing these, doing eight hundred of them the other evening. There will have to be several evenings more of work to get it all done! The following, while written considerably later in the summer of 1920 is included since it gives the names of a few of the orphanages that the orphans traveled from to attend the Christmas celebrations in January of that year. Here follow some of Dr. Parmelee�s comments on Mairigs in one of her letters. The following account by Dr. Parmelee was written on the latter part of the day after the Christmas celebrations were over. �By nine o�clock in the morning the first orphanage had arrived and was waiting patiently outside the hospital gate. They had gotten up early in the morning, in order to come their eight or ten miles from Hulavank, their village orphanage. It was worth it, for could they not watch the preparations going on in the yard? The boys had been out and swept, and had then installed the wonderful tree, a combination of two small ones. Then came the paper chains and strings of tinsel, and even dyed spools, and American flags, and then to top it all, some wiring and electric bulbs. Who would have dreamed to see an electric lighted tree in this out-of-the- way place! After a time, all was ready and the posts put up, which indicated where each group was to be stationed. There must be careful planning, for as someone expressed it, the �world was to be our guests� on this eventful day. We wondered whether the yard would be crowned with the 2500 children and adults whom we were expecting. But, arranged in groups, as they were, everything went off very quietly and in an orderly manner. We present now a few excerpts written by Dr. Parmelee on January 26, 1920 but first we present the following excerpt from a letter written by one of the younger A.C.R.N.E. workers at Harput (she was born in 1891), Frances MacDaniels. �Dear Folks:- I wish you could have seen our Santa Claus and his reindeer! We had the Christmas celebration for the children last Thursday [January 8]. It was a bright day, no snow for a couple of weeks, so the ground was dry. We had all our 2800 kids come to the hospital yard. The performance was to come at two, but in the middle of the morning they began to arrive. As we rode down the hill after lunch we passed orphanage after orphanage, rather suggestive of the deportations. They each had a place in the yard and an American to welcome and stay with them. We had a Juniper tree made of several put together, decorated with dyed spools, the ordinary chains, and little baskets and lanterns made of canned food labels, together with some real trimmings left by the missionaries. They had Christmas songs by the various orphanages, and a snowball fight by the kindergarten kids. To warm them up before the feature of the afternoon Mr. Means [Gardiner C. Means] got up on the hospital porch and led off in some exercises; these made a great hit, literally as well as figuratively, for they didn�t spread out enough to miss each other�s noses. Just as they got settled down again the gates swung open and Santa (Mr. Riggs in a regular Santa costume) dashed(?) in in a two wheeled ox cart drawn by four yoke of oxen. The cart was gaily decorated with bright red cloth and evergreens, the oxen each wearing red and white striped kilim. The boys driving the oxen were swathed in sheets. They circled around the drive a couple of times amidst the cheers of the children and stopped beside the tree. Santa, after a speech, got out and pulled out a large bag for each orphanage, from under the tree. Each bag contained for each child an unbleached muslin handkerchief full of leblebs,17 raisins and three pieces of candy. For each mairig [little mother] and quirig [little sister] two cakes of soap. It was fun to watch the different children. Some tucked theirs away untouched, others opened and dove in, going away with only the empty handkerchief. They searched out the candies, and some started swapping red for green, etc., like regular children. I suppose some swapped licks off of them too. The following several photos (Figs. 5 through Fig. 9) show some highlights of the celebrations. We thank Oberlin College Archives for permission to present these. Fig. 5. Armenian orphans in the courtyard at what was earlier called the Annie Tracy Riggs Hospital compound. (It came to be called Near East Relief American Hospital, Kharput after the A.C.R.N.E. relief efforts took hold). The Christmas tree, complete with electric lights, is directly in front of the Hospital. Note the American flag. From the MacDaniels Near East Relief Album, Oberlin College Archives. Figs.6a and 6b. Closer views of the orphans in attendance at the Christmas celebration. Fig. 7 and Fig. 8. Santa Claus in his sleigh (ox cart) drawn by �stand-ins� a.k.a. oxen for reindeer who had apparently been previously engaged elsewhere. The drivers are older Armenian lads clad in white sheets. Oberlin College Archives. Fig. 9. Rev. 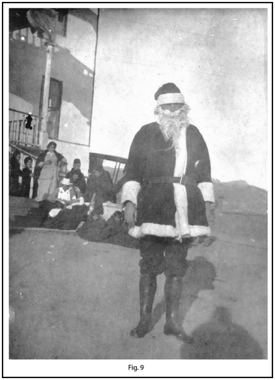 Henry H. Riggs in his Santa Claus costume. The porch of the Hospital may be seen in the background. Note some of the orphans on the ground wrapped in blankets (see letter describing this above). From the MacDaniels Near East Relief Album, Oberlin College Archives. Fig. 10a and Fig. 10b. Enlargement of Dr. Riggs from the photograph of him in costume (Fig. 9) and juxtaposed with an image from a photograph taken slightly later in America. Santa was clearly a bit thinner in Harpoot. On January 26, 1920 she wrote of her additional Christmas activities. It is the story of the adults that is far more varied and many blanks remain to be fitted into the whole. Hopefully some Groong readers will consider this all food for thought. 1. 1. We have made no attempt to reference this paper every step of the way but we have felt obliged to include some citations to the literature. These are provided in these fairly extensive Endnotes. We have also included two Appendices because we feel strongly that certain information needs to be included. Their substantial length emphasizes that we know some of the younger generation have an incomplete understanding of the region and the times. This is, of course, understandable since with the passage of time we all become more remote from what we were told while growing up about the erkir (or ergir – �the Land,� the �Old Country�) in those days of long ago. Our first Appendix attempts to deal in some detail with the dating of the celebration of Christmas especially by the Armenians. Appendix 2 is concerned with the place names Kharpert and Mezreh or Mezereh. Needless to say, placing these at the very end indicates that one need not be distracted in his or her reading of the paper by referring to any of this. They have only been added to achieve some measure of completeness. 2. Harpoot and its pronunciation. Harpoot is but one spelling in romanized transliteration of the Armenian Kharpert. Harput is generally retained in the Turkish spelling. For details on Armenian Kharpert in English one can refer to Richard G. Hovannisian, ed. Armenian Tsopk/Kharpert, (Costa Mesa, California: Mazda Publishers, 2002). For a general but good account of the events at Harpoot during and immediately after the Hamidian massacres and the relief work with orphans of that period etc. one can refer to William Ellsworth Strong�s �The Story of the American Board; an Account of the First Hundred Years of the American Board of Commissioners for Foreign Missions� (Boston, New York, The Pilgrim Press; American Board of Commissioners for Foreign Missions, 1910) – for a digitized version refer to https://archive.org/details/storyofamericanb1910stro. A more modern perspective on the broad range of activities undertaken by the American missionaries is provided by Barbara J. Merguerian in her �Missions in Eden: Shaping an Educational and Social Program for the Armenians of Eastern Turkey� in New Faith in Ancient Lands. Western Missions in the Middle East in the Nineteenth and Early Twentieth Centuries, ed. Heleen Murre-van den Berg (Leiden and Boston: Brill, 2007). Reference should also be made to Jonathan Conant Page�s �Ringing the Gotchnag: Two American Missionary Families in Turkey, 1855-1922� (Boston: New England Historic Genealogical Society, 2009). It is a very readable, yet scholarly account of the long-serving missionary families of Wheeler, Barnum and Allen and their work at Harpoot. 2. 3. See for example The Missionary Herald vol. 72 January (1876) pg. 5. 3. Herman Norton Barnum, D.D., was born in rural upstate New York near Auburn on December 5, 1826. He graduated from Amherst College, Class of 1852 and from Andover Theological Seminary in 1855. In July 1860 he married Mary E. Goodell, daughter of Rev. William Goodell who served as a missionary in Constantinople for a good many years. Rev. Barnum joined the Harpoot Station of the American Board in 1857, and his wife came one year later. The Station had been occupied since 1855 and permanently since 1860. The Barnums were one of the three families (Wheeler, Allen, Barnum) who continued to serve in Harpoot until 1896. Rev. Barnum died in Harpoot 19 May 1910 and his wife Mary died nearly exactly 5 years later also in Harpoot. They had nine children, six of whom died in childhood. All were buried in Harpoot. 4. 4. Winston S. Churchill (1929 and other editions) �The World Crisis: the Aftermath (C. Scribner�s Sons, New York pg. 405. 5. 5. See pg. 79 of �The Slaughterhouse Province. An American Diplomat�s Report on the Armenian Genocide, 1915-1917� (ed. By Susan K. Blair, Aristide D. Caratzas, Publisher, New Rochelle, New York, 1989). While spelling of these Village names is by no means uniform, it will be possible in many cases to locate them on the map in Figure 1. 7. 6. See for instance Taylor, E.L. and A.D. Krikorian (2011) �Educating the Public and mustering support for the ratification of the Genocide Convention: Transcript of United Nations Casebook Chapter XXI: Genocide, a 13 February 1949 Television Broadcast Hosted by Quincy Howe with Raphael Lemkin, Emanuel Celler and Ivan Kerno.� War Crimes, Genocide & Crimes against Humanity Vol. 5: 91‐124. 8. 7. Susan K. Blair�s edited version of Consul Leslie A. Davis� final report that she framed in the context of the title �Slaughterhouse Province� provides much evidence that supports this viewpoint. Vahakn Dadrian has drawn attention with reference to the Military Tribunal Trials to the key indictment of Dr. Behaettin Sakir, one of the most influential and ruthless of the Ittihadist leaders. A telegram was sent to his subordinate in Mamuret ul Aziz (Harput) Vilayet on 21 June 1915 demanding to know whether the Armenian leaders there, referred to cryptically as �harmful people� were being promptly liquidated or merely �deported� – see pg. 84 of V. Dadrian (1993) �The secret Young-Turk Ittihadist Conference and the decision for the World War I genocide of the Armenians� Holocaust and Genocide Studies vol. 7, no. 2 pgs. 173-204.) It is noteworthy that Dr. Mark H. Ward who served at Harpoot describes in his �The Deportations of Asia Minor, 1921-1922� (London, 1922 published by the Anglo-Hellenic League and the British Armenia Committee) wherein he speaks mostly of the deportation of the Greeks (and any residual Armenians) from the Pontus area mentions that about 5,000 out of some 30,000 deportees �escaped from the convoys.� One doesn�t know what eventually happened to these escapees but the death toll out of the whole was huge. What had happened to the Armenians was now being carried out on the Greeks. His writings give a fairly good idea of numbers involved. Parenthetically, this state of affairs provides one of the several reasons we believe that there are many more descendants of Kharpertsis in the Diaspora. Far fewer Diasporan Armenian descendants are to be encountered whose roots lie in other places of Turkish Armenia like Sassoon, Bitlis, Moosh, Erzerum, Angora, Shabin-KaraHissar, Kars etc. Attempts at the extermination of the Armenians through genocide would appear to have been somewhat more fanatical and efficient, relatively speaking of course, in these areas. This perverted diligence due to regional peculiarities or even specific Turkish regional administrators perhaps accounts for the fact that there seem to have been fewer opportunities for survival of Armenians in/from these places. 9. 8. Another perspective that might be mentioned for a fuller equation is that in a male-dominated society such as that of Ottoman Turkey the act of �decapitating� the nation (literally and figuratively) by getting rid of men and youths, and uprooting the remnants by deportation (predominantly women and children) the task of destruction was for all practical purposes complete. By analogy, ripping a plant out of the soil and allowing it to wither and die, was an adequate solution to any Armenian problem. 11. 10. Ruth Azniv Parmelee is a person who many have heard of in reference to Armenians – see for instance our contribution with some photographs at http://groong.usc.edu/orig/ak-20110627.html − and later in connection with the Greeks. She was no stranger to relief work for Armenians. Her parents offered assistance to Armenians in Trebizond after the Hamidian massacres when she and her slightly older brother Julius were children of about 12 and 10 years old respectively – but old enough to know what had gone on. Considerably later, after she had gone to America for her education and her eventual medical training and earning her M.D., she returned with her widowed mother to Harpoot in 1914 and began to carry out medical, especially obstetric and pediatric, work. After her return to America in 1917, having left Harpoot with Consul Davis and other missionaries on May 17, she wrote at the request of Rev. Dr. James L. Barton, Foreign Secretary of the American Board for Foreign Missions in Boston, a statement under the telling rubric of �massacre conditions at Harpoot, Turkey.� Highlighted in her deposition was her �Visit to the Exile Camp in Mezereh.� In reminiscing a number of years later about her work in an article entitled �Twenty Years in the Near East� [Women in Medicine 51, January, 1936 pgs. 20-23] she said of the summer of 1915 �when all of this wretchedness began �we entered a phase of definite relief work for Armenian refugees, who had escaped from the deportations carried on in so unwholesome a manner, throughout those warm months�most of my attention was required by the poor wretches, lying on piles of rags under leaking roofs, sick of typhus fever and other diseases due to lack of nourishment and proper sanitation. Obliged as I was to squat on the ground when paying visits to these poor patients, it was impossible to avoid the infection carrying insect, so that an attack of typhus was added to my list of war experiences.� Dr. Parmelee died 15 December, 1973 and was interred January 8, 1974 in the Lot owned by the American Board of Foreign Missions – Section I/South, range P, Lot 25, Newton Cemetery, Newton, Massachusetts. She is one of the many friends of Armenians, including missionaries and physicians, whose graves we have visited and where we have even attempted to undertake �graveside interviews.� One thing that is abundantly clear about Dr. Parmelee is that she was experienced and determined and had few illusions as to what was going on during the genocide and afterwards. In one of her many talks given once back in America she summarized it all simply and directly:- �During my three year�s work at Harpoot, Turkey, it was my lot to learn at first hand something of what has been called �The blackest page of modern history� – the definite effort of a government to exterminate one of its subject races. Enver Pasha, Minister of War, told our Ambassador before the deportations took place, that it was the plan of the leaders of Turkey to get rid of the Armenians, then the Greeks, then the foreigners, and then have Turkey for the Turks. The system and efficiency with which they went about the extermination of the Armenian race, made one suspicious that Germany did more than just to close her eyes to what was going on in Turkey in 1915. Having succeeded so well in the first part of their program (leaving only a weakened remnant of Armenian women and children in a destitute and starving condition) the Turkish government is now carrying out the same measures with the Greeks who are subjects of its Empire.� Dr. Parmelee returned to Turkey with the first contingent of A.C.R.N.E. volunteers and was assigned to Harpoot presumably because of her familiarity with the place and languages. Dr. Parmelee became acting director of the Harpoot Unit of Near East Relief when Rev. Henry H. Riggs was deported in November 1920 – nominally on order of Angora (there was no written order or reason given for the deportation). She served in that capacity until January 10, 1921 when she served under Dr. Mark H. Ward who became Unit Director until April 1, 1921. Dr. Parmelee was given her marching orders along with Miss Isabelle Harley (from Rhode Island) by a very unscrupulous Turk (Hamdi Effendi) who nominally had been appointed as a Commissaire [commissioner] to cooperate with the Near East Relief in Harpoot. But all this, while interesting, is a bit off our immediate mark for this paper on Christmas for the orphans. 14. 13. We have never appreciated use of the word �refugee� by some writers in the context of the Armenian Genocide. The �Webster-Roget Dictionary and Treasury of Words� from 1922 defines �refugee� as one who flees for protection, especially from political or religious persecution.� No mention is made of �war�. To the contrary, today�s �Oxford Dictionary of the English Language� apparently thinks fleeing from the ravages of war is very important, even paramount? And defines �refugee� as �A person who has been forced to leave his or her home and seek refuge elsewhere, esp. in a foreign country, from war, religious persecution, political troubles, the effects of a natural disaster, etc. ; a displaced person.� Words and connotations may change with time of course, but Armenians in the vast majority of places in Turkey in Asia certainly did not flee from war zones – and neither did they flee from civil war activities in which they were antagonists or protagonists as some Turk revisionists claim. Armenian civilians were driven out on a specific plan and for a sole purpose – annihilation. The to us, at least, laughable notion of �social engineering� as a major objective in connection with the deportations emphasizes the utter intellectual bankruptcy of some self-appointed �scholars� seeking to come up with something clever-sounding and original. The closest bit of equivalent nonsense is a statement we read not so long ago about �existential genocide�! Exactly what does either of these phrases mean? 17. 16. Kilim refers to a flatweave woolen fabric. Roasting chickpeas is rather intricate process and may take as long as a week to carry out. There are several grades and degrees of roasting –done at intervals of a day or so. The chickpeas are moistened (definitely not soaked or boiled) by subjecting them to variously moistened toweling for a required period prior to subjecting them to the roasting. This is done by constant stirring and turning in hot sand or carbonized wheat hulls to get the desired degree of roast. Normally referred to as lablaboo in Armenian it would be fascinating to know how or where the relief workers obtained the lablab. From what we have written and know about the process someone who knew what he/she was doing had to be involved. A few relief worker accounts describe the making of bulghour by boiling and drying but none that we know of ever discussed the preparation of cicer (chickpeas pronounced �siss-errh�) into lablaboo. 18. 17. This seems to be an error. We have but little doubt that the person being referred to was Maria Jacobsen, a Danish missionary nurse, who had remained on site during those horrible years ministering unto Armenian orphans etc. Her story is one of heroism, bravery and long service to the Armenians, and is well-known. Undoubtedly the MacDaniels got to know her better in the next few months and in fact occupied her quarters when Miss Jacobsen left Harpoot in the late summer of 1919 The error probably derives from transcribing Frances� handwritten letters to typewriter back home for circulation among family and friends as so-called circular letters. Alternatively, but less likely Frances heard Maria�s name imperfectly when they were introduced and assumed she was German because of her accent. Curiously, Cincinnati had a substantial population of German origin, undoubtedly many with accents. In any case, we thank those who have attempted unsuccessfully to help us identify any �real Schwester Merena.� Finally, reference must be made here to Matthias Bj�rnlund�s �Recording death and survival: Karen Marie Petersen, a missionary witness to Genocide� in Haigazian Armenological Review (Beirut) vol. 32 pgs. 321-340, 2012 for some detailed descriptions of the genocide as witnessed by the Danes in Harput/Mezreh, as well as the general work of the Scandinavian missionaries there since 1909. While Maria Jacobsen is the best known of them, and gave the longest service, there were in fact four workers at Harput/Mezreh. See also by Matthias Bj�rnlund �Scandinavia and the Armenian Genocide� in The Armenian Weekly April 26 2008 pgs. 19-21 and yet another paper by Bj�rnlund entitled �Karen Jeppe, Aage Meyer Benedictsen, and the Ottoman Armenians: national survival in imperial and colonial settings� Haigazian Armenological Review (Beirut) vol. 28 pgs. 9-43, 2008. 19. 18. Reference may be made in the first instance to Jakob K�nzler�s Im Lande des Blutes und der Tr�nen: Erlebnisse in Mesopotamien w�hrend des Weltkrieges (1914-1918) (English trans. By Ara Ghazareans, Hans-Lukas Kieser as In the Land of Blood and Tears: experiences in Mesopotamia during the World War (Armenian Cultural Foundation, Arlington, MA.,2007). We too have provided some details on this subject of the �orphan exodus� and especially the photographs associated with it in our �Achieving Ever-Greater Precision in attestation and attribution of genocide photographs� in The Genocide of the Ottoman Greeks. Studies on the State-sponsored campaign of extermination of the Christians of Asia Minor, 1912-1922 and its aftermath� history, law, memory (Tessa Hofmann, Matthias Bj�rnlund, Vasileios Mechanetsides, eds.) published by Aristide D. Caratzas, New York and Athens, 2011) pgs. 389-434. There is little doubt that things concerning calendars, liturgical and ceremonial certainly are confusing to most of us, and many scholars have written immense amounts on calendars and the ancient traditions of Christianity. Years ago one of us (ADK) started keeping a file on calendars as they relate to things Armenian. Today, many years since it is over 6 inches high! One is forced to admit that things are hardly more clear to us today than they were thirty years ago (despite trying to study such works as Frederick Cornwallis Conybeare�s The Armenian Church: heritage and history, compiled, with an Introduction, by the Revd Nerses Vrej Nersessian, published by St. Vartan Press, New York 2001) but at least we believe we are closer today to being on the mark concerning the celebration of Christmas in the Armenian Church. What follows is an attempt to make a pr�cis of those things found in our stack that just might shed at least some light on it all. In the very least, it should give some insights into why it is possible to celebrate Christmas three times in the Armenian tradition. We learn that in the first few centuries A.D. (Anno Domini, nowadays reduced to the secular common era, C.E.) Christmas, Christ�s Mass or the feast of the birth of Christ, did not exist as such. The Christian Church only celebrated the festival of the Resurrection (Easter). But, apparently according to a Roman almanac, Christmas was in fact being celebrated in Rome by 336 A.D. In 354 A.D. Pope Liberius is said to have instituted the celebration of the Nativity on 25 December as part of the church�s �Christian calendar�. (Some say that among other things this date was selected because it expunged to some extent the pagan festival of Saturnalia, or the �return of the sun� and the winter solstice.) In the Armenian Church, 25 December as the date of the birth of Christ [Dznount in transliterated Armenian] was never accepted. Instead, following the decisions of the Bishops of the churches convened through the agency of the Roman Empire�s first Christian Emperor Constantine (the Great), the first ecumenical council was convened at Nicaea in Bythinia (now Iznik, Turkey) in 325 A.D. That Council, probably best known to laymen for giving its name to the Nicene Creed, fundamental to much of Christianity, ordained that the baptism of Christ be celebrated on January 6. [Equally or perhaps more importantly, the means to set the date for Easter was also set for at that Council]. Aristakes, the Armenian Bishop and son of Catholicos Krikor Lousavorich, attended the Council because his father was too old to do so. Thus, in Armenia January 6 based on the baptism of Christ was adopted as the date for the celebration of a collective feast of all the mysteries that were manifest before Jesus Christ revealed what we�ll call a �public� life. The Nativity, that is to say what was referred to in older western theological writings and literature as the �Fleshly� or �carnal birth�, and the Baptism were celebrated as a double feast in a single festival on the same day. In short, among the Armenians the manifestation of Christ or appearance of God to man as reflected in the appearances of our Saviour, His revelation to the eyes of men, or as is sometimes expressed �the Revelation of our Lord Jesus Christ to the Gentiles� which is generally taken as being first embodied in the tradition of the Adoration of the Magi [the three, twelve whatever number for that even is undecided �Kings of the Orient�] assumed a prime place early on. Christ�s baptism was paramount. It seems that for all these reasons, the fixed date (as opposed to a moveable one) of 6 January continues to be simultaneously celebrated as the Feast of Christmas (the Nativity, also viewed as a time of being reborn, regenerated, and sanctified in the waters [of the Jordan]) and the Revelation of Christ as God or Son of God (Epiphany [literally the �showing forth�] The Armenian Church when using English to describe this celebration has preferred to use the Greek-based word Theophany, a word etymologically based on �Manifestation of God� [Asduadzahaydnoutiun in transliterated romanized Armenian]. For the Armenian Church then, using the date of the Baptism of Christ based on the Old style or Rumi calendar [revised Roman or Julian, introduced by Julius Caesar and which was solar based], that is January 6, is when the Holy Theophany is celebrated. (One will immediately recognize that one of the peculiarities of the date is that today in countries such as the United States and Europe and elsewhere celebrate Christmas on January 6 going by the Gregorian calendar! That is certainly one cause for confusion. Apparently the celebration is more tied, as it were, to the date than the specifics of calendardom. On the other hand, the use of the Julian Calendar is still retained, we are told, in the Armenian Patriarchate of Jerusalem, and thus the date of 6 January for Theophany on the Old style calendar and Gregorian as followed today translates to 19 January, thirteen days later on the Gregorian calendar. (The Gregorian calendar which Pope Gregory XIII introduced in 1582 was apparently developed and apparently for a very practical reason. The main motive seems to have been to keep the accumulated errors in the Julian [solar] calendar from allowing Easter to drift away from springtime. (It is of some interest that the Old Style calendar was used in Armenia until the end of 1923. On 1 January 1924 the New Style [Gregorian] calendar was adopted on order of Catholicos Kevork V. It was of special interest to us in the course of reading an account by a senior American Near East Relief worker to Erivan who wrote in 1922 in a letter back to America that he arrived in Erivan on 19 January only to find things closed because of the Christmas holiday. That was news to us, but then again lots of things continue to be �news� to us! Fr�d�ric Macler, the French scholar of all matters Armenian, wrote in the Encyclopedia of Religion and Ethics (Chas. Scribner�s Sons 1955 vol. 3, pgs. 70-73) that �The Theophany was originally always celebrated on a Sunday; it was only in later times that it was fixed for the 6th of January.� On Christmas Eve, that is the eve of the Nativity and Theophany of Our Lord Jesus Christ, a candlelight service [Djerakaluys Badarak] is celebrated. And, so on and so forth. Would it not be nice to have a short and sweet account? In deference to American officialdom and reflecting the time with which we are here concerned, the spelling Mezreh is used in the this paper and derives from the fact that when the first United States Consul to the area, Dr. Thomas H. Norton, requested in a letter via the U.S. Consulate General, Constantinople dated January 10, 1901 from Harput that the Department of State, U.S.A. address correspondence to him �Consul of the United States (Harput) Mezreh, Mamouret ul Aziz, Turkey in Asia� (via London and Constantinople.) The spellings Mezireh and Mezereh, based, of course, on transliteration from the Armenian, are also widely encountered in period writings, and some might say the latter transliterations are more accurate. They are right of course. Maps using Armenian spellings reflect the proper pronunciation. We include here one taken from Vahe Haig�s massive 1500 page book Kharpert and her Golden Plain (Kharberd ew anor oskeghen dashte: hushamatean azgayin, patmakan, mshakut��ayin ew azgagrakan / Ashkhatasirets�� ew kazmets (prepared and published in New York by the Kharpert Armenian Patriotic Union in 1957). This volume, written in Armenian includes very brief pr�cis in English and French. The town and the Vilayet both bore the name Mamouret ul Aziz. Some explanation is in order of where Harput is, or more precisely what a reader should understand by Harput. For the Turkish government, Harput was and still is the name of a city in eastern Turkey. The spelling Harput used here, even Harpoot, Harpout, or Harpouth(e) became commonplace through the writings of those like the American missionaries who entered the region in the early to mid-1800s to 1917 when their presence became much curtailed and for all practical purposes eliminated. Harput was the preferred designation by the United States government. There is little doubt that the name of the town, variously spelled Kharput, Kharpert, Kharpothe or Kharpet etc., situated on the top of a small mountain, was of Armenian origin. Those unfamiliar with the sound suggested by the spelling kh might, pardonably, attempt a simulation of clearing one�s throat prior to spitting! Few seem to agree exactly on what Khar means in Armenian, at least in this instance, possibly �rock�; the second element clearly means �castle� or town. Because the pronunciation was perhaps initially not easy for most of the missionaries (many, some say most did, however, become fluent in both Armenian and Turkish), the spelling Harput etc. seems to have evolved. For Armenians, Harput meant not only a city, but a much wider area, almost a Province unto itself, a nahank. The city of Harput, not surprisingly, and like all ancient cities has had a rather checkered and difficult-to-unravel history. The town was located about 4350 feet above sea level, and was supposedly best described as being built on a hill or small mountain terrace. About a thousand feet lower in altitude than Kharput �mountain,� and about three miles to the southwest, was a small, very old town called Mezreh. Mezreh lay at the foot of the plateau overlooking a vast and fertile plain where there were many Armenian villages. (The Armenians refer to this plain as the Golden Plain of Kharpert.) The potential for Mezreh being a capital district was apparently suggested by some official or other who was inspecting the area during the reign of Sultan Abdul-Mejid I (1839-1861). This led to the building of some military barracks. During the reign of Sultan Abdul-Az�z (1861-1876) the �twin cities� of Kharput-Mezreh took on the official name of Mamuret-ul-Aziz, meaning �Mehmet�s beloved,� aziz means beloved in Turkish. The name Mamuret-ul-Aziz is said to have been extended to the entire sanjak (a subdivision of a Vilayet, essentially a county by our standards; from Eyalet meaning Province or State in Turkish) in 1879, and in the same year it extended to the newly constituted Vilayet. Over the years, provincial borders were changed more than once for purposes of bureaucratic shuffling and nominal streamlining, but more, we believe, with an intent to gerrymander–inevitably to the advantage of the Muslim population and to the marked disadvantage of the Armenian Christian population. �Twin Cities� Kharput [Harput]-Mezreh became the official seat of the Ottoman government. But by the early 20th century, various Valis (Governors General of the Vilayet) moved their headquarters from Kharpert to Mezreh. Even through Mezreh was considerably smaller, about half the size of Harput, it was more the business center. It was also the seat of the 11th Army Corps of the Turkish Army. Apparently Mezreh was not an attractive town by any stretch of the imagination but it was better situated for commerce and had much better accessibility from the dozens of villages on the surrounding plain. Armenians referred to both the city of Kharput [Harput] and the Province as Kharpert. Anyone Armenian or with Armenian roots or connections at any level originally from the region referred to himself or herself, first and foremost as a Kharpertsi, i.e. someone from Kharpert [Province]. And, if they specifically came from Kharpert City, they referred to themselves as Kaghakatsis, i.e. of the City, much like New Yorkers refer to �the City�, as if there were no other. Those from the villages referred to themselves as kiughatsis [keghatsis]-�villagers�. Fortunately for us, Vahe Haig�s massive coverage of Kharpert, some 1500 pages, was written and compiled when many of Old Country Armenians and Armenian genocide survivors were still alive. It is interesting to note that the Armenian page is dated 1957 but the added title page in English is dated 1959 It would appear that the book took that long to edit before it went to final press. The map below and an enlargement will emphasize that the spelling in English of Mezreh really should be Mezireh? We even know someone who immigrated to America with the surname of Mezirelian. The name provincial name, Mamuret-ul-Aziz, synonymous in the eyes of Armenians with Kharput [Harput] is, of course, no longer used; certainly Kharpert is not. Elazig (pronounced EHL-lah-zuh), became the �new� provincial capital of the same name. It is but a contracted form of Mamuret-ul-Aziz, and represents the place that has gradually re-grown and developed post WWI from the old small city/town of Mezreh. Old Mezreh is no more. Elazig (estimated population over 287,500 in 2003) is the main city of the region now. In Consul Leslie A. Davis� time, Harput had roughly some 30,000 people; Mezreh had about half that. 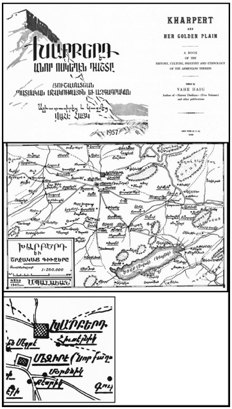 After the birth of the so-called Turkish Republic in 1923 the borders of the old Province of Mamuret-ul-Aziz were changed again and any surrounding Armenian village names were changed to make them �sound more Turkish. Even so, one can still find in print that the city of Elazig is also called Elaziz, Elazid, Elazýýð, Alaziz, Mamuret el-Aziz, Mamuret-ul-Aziz and Mamurelulaziz but that is sure to die out with time and Elazig will come to dominate, if indeed it has anything of the sort to do. Old Kharpert City on the citadel high on a hill/mountain is but a ruin now, said to be used as a place for local Kurds and Turks for picnicking under the walls and ruins of the old castle. The Armenian parts (the taghs, meaning precincts- somewhat comparable to wards or parishes in America) of Kharpert City were deliberately gutted and destroyed during World War I period. Earthquakes have likewise taken their toll. A small town called Harput has grown up around it but not on the exact same site. The citadel and its ruined castle is still a bit of a tourist attraction but Harput-Elazig region is considered even today a bit of a backwater. Firat [Euphrates] University was founded in Elazig in 1975. From what we have ascertained, it is no great center of learning. This is ironic in the context that the Americans wanted to expand and relocate Yeprad Colej to the lower city because they needed space to develop and grow. This never happened of course. We thank Hoover Institution Archives, Stanford, California for access to the Ruth A. Parmelee Papers, and the Oberlin College Archives for access to the MacDaniels Near East Photo Album and letters. We thank Smith College Archives in Northampton, Massachusetts and the University of California Archives Berkeley. Last but by no means least, we thank Mrs. Ellen M. Speers for generous help throughout all our studies on the work done by her parents when they served in the A.C.R.N.E., and by making copies of various letters and photographs available for study.